Joining in with Jen, here are four happy photos from the past week, a rather food-heavy edition. Always in pursuit of breakfasts I want to eat, I have been enjoying smoothies when I have a little extra time in the morning. They're easy and filling. This one was made with a scoop of vanilla-flavored protein powder (I like Aria), a cup of milk, a banana and a handful of blueberries. I've been enjoying my little kitchen radio. We keep this little radio on the kitchen windowsill; it's small but it has excellent reception. It may be on at any time during the day, but always in the early evening. I listen to NPR's "All Things Considered" as I am starting dinner at 5:00. After I've heard the day's news, I'll switch over to music, usually a local "oldies" station (which now plays songs from the 1980's, yikes). We have a more advanced stereo system but I like my little radio; it's more subdued, quieter, more like background noise than a full stereo experience. It feels simpler - retro, even - and not just because I'm listening to the greatest hits of yesteryear. Evening leisure time with the Bear usually involves a movie. We watched "The Big Lebowski" (an old favorite of his) and I crocheted, working on my baby ripple. We ate popcorn, as we often do; I like to make it on the stove, in the old-fashioned way, in a big, heavy pot. This time, we had some microwave cheddar cheese-flavored popcorn that the small Bears had asked for in the store. It wasn't great. But the company was and we had a good old cozy time. The Bear's birthday tiramisu went over well. I've made it many times; he usually asks for it on his birthday and I've also made it as a Christmas dessert. It's delicious and decadent, but deceptively easy to make. I've been using this recipe for a long time. We ate it with the Bear's parents, after his chosen birthday dinner at a Thai restaurant. He loves tiramisu and I love to make it for him. He had a great birthday and he thanks you for all of the birthday wishes. Hello to my new readers and followers! I'm so glad you're here. I hope you enjoy your visits to the Thistlebear home. 52 Weeks of Happy is such an awesome idea! :) I truly love it. Your week seemed lovely and relaxing. The tiramisu you made looks delicious, yum! I really enjoy these happy posts - they make me happy! Hi Jennifer, Lovely happiness!!! Your tiramisu looks delicious!! !Thanks for the easy to follow recipe link!! !Going to try it for sure!! !Have a happy and creative week!!! Lovely happy things. Tiramisu looks lovely, my husband favourite dessert and The Big Lebowski is one of his favourite movies too! these happies of ours rock round so quickly. I always look forward to yours. I would have opened the letter too - I am such a nosey parker. I'm checking out the link for the tiramisu. I am on dessert duty for our family Christms lunch this year. Food heavy posts. Food heavy life. I'm happy with that! You are such a tease Jennifer with all those foodie pics! I am still on the WW diet, trying to maintain or even lose a bit more before my holidays! P.S. loving your baby ripple blanket! Of course you had to take a bit of a peek, I mean it was already open. sad to think that Robby did not notify his friends and family that he had moved. You look like you have been having a yummy time. Happy belated Birthday to the Bear :) Yummy post . Congrats on the give away win ! I'm definitely going to check out your tiramisu recipe...it could be just the ticket for Christmas dessert. Christmas in Australia is hot so cold desserts are just right! Yours looks delicious...and Christmas will definitely not be sugar free! Sounds like another amazing week. I like listening to songs from the 80's too, my era. Tiramisu is my hubby's favourite dessert too, though I've never made it as there's only him who likes it. I might have to click on the link and surprise him. I always love these simple and peaceful glimpses into your happy life! The photos are always lovely, capturing textures and lighting and beautiful composition. Not only that, but I love matching our similarities - in this case, fondness for morning fruit smoothies and NPRs "All Things Considered." 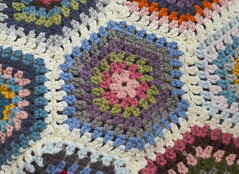 love the colors of your crochet project.. will it be a blanket. I know what you mean about not wanting a full stereo effect! I am sure the baby will love it! Lovely happies Jennifer - which is what I've come to always expect from you - happy lady, wife and mother! Very happy week, Jennifer! Your smoothie looks delicious! That is what I have for breakfast almost everyday. The tiramisu looks really yummy. I have never made one, but I think you have inspired me! 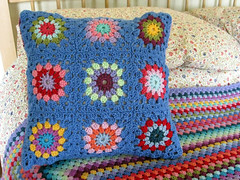 Your crochet project is so pretty, Jennifer! I keep making less than bold attempts at crocheting, but I'm still such a novice. 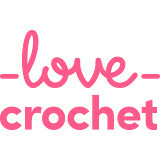 I really do enjoy the act of crochet -- very peaceful and calming. That's a very delicious-sounding dessert! Happy Belated Birthday to the Bear! That tiramisu looks lush!